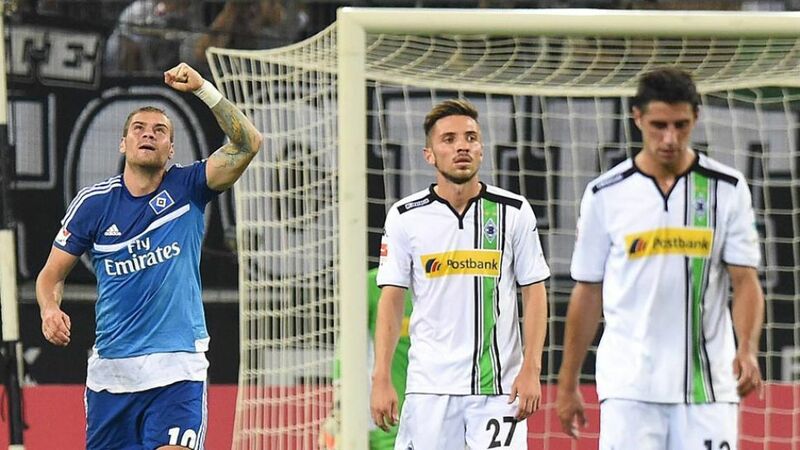 Mönchengladbach - Borussia Mönchengladbach’s nightmare start to the season continued on Friday evening with a 3-0 defeat at home to Hamburger SV in the Matchday 4 opener, their fourth consecutive loss this term. The visitors began the brighter of the two sides, pressing their hosts high up the pitch. They opened the scoring in the 11th minute when striker Pierre-Michel Lasogga latched on to a poor back-pass from Tony Jantschke, rounded Yann Sommer and slotted the ball into the empty net to give the guests a deserved lead. Lasogga’s thumping header from a corner on the stroke of half-time gave Gladbach a mountain to climb after the break. The Foals almost pulled one back early in the second period, but Andre Hahn was unable to keep his header from Oscar Wendt’s pinpoint cross down. They would rue that miss moments later when Nicolai Müller latched on to a long ball over the top to lob Sommer and give Hamburg their second win this term. Lasogga set the tone for the game early on by harassing the Gladbach defence relentlessly. A backline that was already nervous following the team’s poor start to the campaign was put on edge by the striker’s tireless running and imposing physical presence. He was rewarded for his efforts with two well-taken goals, taking his tally to three for the season. Gladbach have never started a Bundesliga season as badly as they have 2015/16. Taking their defeat against FC Augsburg on the final day of last term into account, this was the Foals’ fifth successive league reverse. Bottom of the table and with just two goals scored thus far, it has hardly been ideal preparation for the start of their UEFA Champions League adventure away to Sevilla.